Guru Nanak Public School, Sambalpur has advertised in the SAMAJA newspaper for recruitment of Teaching Faculty- Teachers PGT / TGT jobs vacancies. Interested and eligible job aspirants are requested to apply within 10 days from 07th December 2018. Check out further more details below. 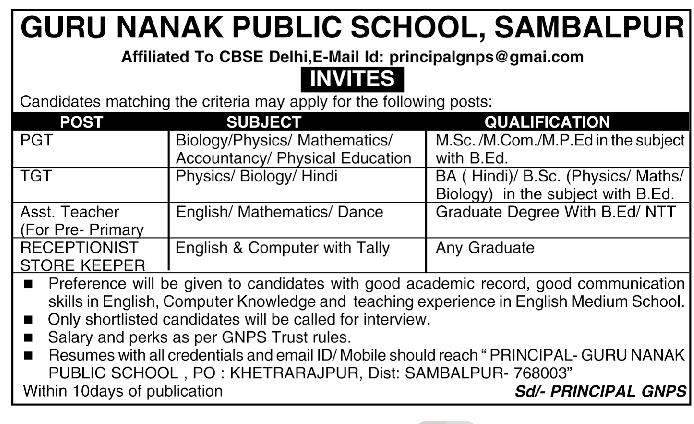 About School: Guru Nanak Public School, Pitam Pura, is an English medium co-educational school, being run on public schools lines. The school was founded in year 1984 under the patronage of Sri Guru Singh Sabha, Punjabi Bhagh. The school which made a modest be/ginning as a nursery school in a private building has grown in strength. How to Apply: Interested and eligible candidates are requested to send their application along with CV, copies of certificates, PAN card, Aadhaar card and recent passport size photo to the postal address given below.